When I analysed the most tweeted blog posts ever, I found that Twitter users like posts that are around 1,100 words long. When I wrote the most important blogging analysis ever, I found that the average length of popular posts was 1,600 words. This was quite surprising to a lot of readers and is a figure far higher than most people are producing. In the comments for one of these posts, someone gave me the idea of analysing different industries to see the average post length in each, so they could gauge how long their articles should be. I’m not a blogger who will guess numbers and just throw stats out there, so I decided to do an in-depth analysis. I picked 3 posts from 5 blogs in 8 different niches (confused yet?) and noted the word count for each. I tried to pick some of the biggest sites in each niche as it’s pointless using unsuccessful blogs as your guide. For two of the niches I didn’t know the top sites personally, so I relied on Technorati and The New York Times for recommendations. Before I share the exact data, I’ll share what this post is really about: the results. I love doing tests like this as I apply them to my own endeavours, but as I do write for an internet marketing blog, it makes sense to share them with you guys as well. I picked 3 random posts from every site, so there are a total of 15 blog posts making up the stats for each industry. Some people might prefer a larger sample, but I prefer to look at the successful sites rather than a niche as a whole. 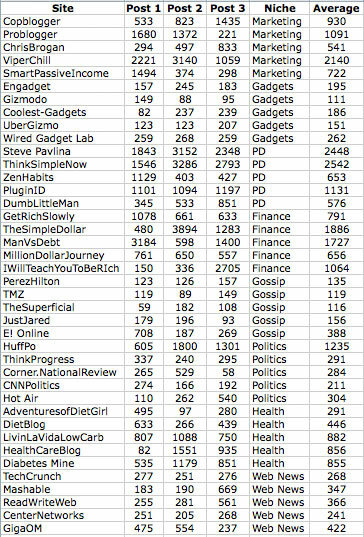 As you can see, Celebrity Gossip, Web News and Gadget blogs tend to post short articles. However, don’t forget that these blogs are known to post multiple times per day and I know one of them publishes more than 20 posts, daily. Sites in industries like Marketing, Finance and Personal Development post less (1-7 times per week) but write much longer articles. If your niche isn’t here then look at successful sites to see the types of posts that other bloggers are writing and how long their articles are on average. In some cases, a blog would write a 1,000 word post and then a 300 word post, which is why I worked with averages. Don’t think that you have to stick to a specific length, I just believe it’s useful to know how much the top players in each industry are writing. I was going to put all of this into a table, but I think a screenshot should suffice. If you want to use this data for your own analysis of sorts, feel free to take it. You don’t have to link back here; it’s all yours. I put together this data manually but it didn’t actually take that long. Doing this made me realise how much more productive a bigger screen (I’ve just purchased a 27″ iMac) is making me. It makes sense to think that if the big guys are writing posts of a certain length, then you should do the same to be one. Yet, one piece of advice most successful bloggers give is to do something different and stand out from the crowd. There is no doubt I pushed up the average post length of the marketing niche, but I don’t think that hurts me. I believe one of the best things about this site is that I post long in-depth articles that nobody else is willing to write. Similarly, when sites like Engadget and Gizmodo are writing 200 word posts, you can find ArsTechnica writing articles that are thousands of words long and they are one of the biggest websites online. Remember that the only rule in blogging is that there are no rules. My advice is this: write as much as you want to write. Your blog is your home, and your empire, and to some it’s even their baby. If you want to make your blog a profitable entity, then you may need to do some things (initially) that don’t align with you internally. However, if you keep carving out articles that add value, it doesn’t really matter how long they are. You will find someone who loves what you have to say, and loves the length of your content. I believe this post works as a great guide to give you an idea of how much you should be writing – there isn’t much room in the personal development niche for blogs writing 100 word articles – but go with your own instinct and desires after that. Sticking to set numbers takes the flow away from your articles and the fun away from blogging. If you have any other stats posts ideas you would like me to spend far too much time on, please let me know in the comments. Thanks for another great analysis Glen. I believe most people actually prefer to have a post that goes in depth about a subject. That way the can scan all the post and eventually read the parts that interest them the most. You’re welcome Oscar, thanks for stopping by as always. I’m finding more and more that people are enjoying my long articles, and I prefer writing them, so I’m going to stick to that strategy. Thanks for the info. It looks like I need to stay in the 1000 word range for the best results for a marketing site. I really appreciate the research you put in. Nice site! Thanks for the analysis, Glen. After listening to Seth Godin’s Tribes, I realized the need to acknowledge that there are people out there with different interests, likes and dislikes. When we write a post, it will resonate with some people, while boring others. I have, therefore, chosen to write in the way I feel most comfortable, to the people who will enjoy my writing style (with slight modifications to my style in order to provide greater value). Those who like what I write will stick around. The great thing about your analysis is that it shows that there are people out there who actually read and enjoy long posts, as opposed to the assumption we keep hearing that long posts aren’t popular. So true, I love that book. That’s true. As I say at the start, I’m not just someone who will throw stats around (which most people tend to do) and like to look at these things in detail. Now I know exactly what NOT to do. Although I doubt people would be willing to read blogposts that are just over 100 words in length. Perhaps… This is actually giving me some ideas. There’s a personal development blog I love that is: Wakeuptiger.blogspot.com and they only write articles around 50-100 words. Short, but awesome. I think you have hit the nial on the head with your final paragraph. There are no rules, so you are free to write as long or as short as you please – but the key is to finding the ‘right’ length according to your readers! Readers rarely know what you want until you give it to them. Seriously though, glad this came at the right timing for you. Always good to see you here, Andres. I like your analysis of the different blog post lengths (i liked the last one even more than this one). A blog post only has to be as long or as short as it needs to be. Period. Worrying about how long you should make a post is almost as stupid as worrying about the ROI on social media. But start writing 50 or 50,000 word posts on any topic and tell me how well you do. Grant- not doing any research is the same as someone just going and picking stocks randomly. At the end of the day, could you still loose all your money in the market even with the research? Yes. The point is to see what the industry norms/averages are and then go from there. This way you are making a better play. Looking at the data with a scientific mind, I have to say it’s inconclusive, which I think is what you’re saying. I think bloggers forget the “writing is rewriting”, and that judicious editing does wonders for clarity of writing, post-length be damned. Thanks for putting together this analysis. When I’m reading a blog, I personally find longer posts to be of more value when I want to understand a topic in a step by step & comprehensive way. Conversely, when I’m looking for a quick fix, obviously shorter posts do the trick. So I guess the non-rule rule is to go with longer when you have some explaining to do, and shorter when you’re just throwing out an idea or tidbit. I very much appreciate the analysis Glen. It goes completely against the original intuition that I had about the length of my own posts. I started out by writing articles that were lingering between 900 and 1,200 words, and then (apparently in error) I made a conscious decision to shorten my posts to between 300 to 500 words because I felt if I made them shorter I would hold people’s attention, and they wouldn’t be so intimidated. Slowly I’ve realized that perhaps in doing so, I have reduced the value of the content because of trying to make things as concise as possible, perhaps even too much so just for the sake of brevity. I think in my niche and for my topics writing the longer posts makes more sense and adds more value to my readers. I think in my case its appropriate to go back to where I started, and your results prove it. Thanks for the confirmation on something I was already wondering about. This is why I shun the advice that you have to have something new on the blog each day. I don’t have the time or energy to post quality 1,000 word plus articles each day. To me, it’s a lot more important to post content that will last beyond one day. Thanks for the research. Very helpful. Very interesting blog. Word count is something that I’ve never considered. I write about a topic. How ever long that topic may be is what it ends up. Sometimes it’s short and sweet, other times it’s a mile long. But, this did get me thinking about what my average was. Going back and picking 3 blogs I averaged them out to 870 words. I’m happy with that. It does drive me crazy when I come to someone’s post that has only a couple of sentences. Why bother? I like good content, something that helps me or teaches me, and if it’s a really good article, then I don’t mind taking the next hour to read it. Great study. I enjoyed the insight. Under a hundred words (OK – I mean looking really short) – maybe not worth too much. Much more important: Frequency of posts. I don’t like blogs that are posting more than I can take the time to read. Daily is off the chart. Three times a week is a lot. I really like Viperchill and recommend it to others (yes I’m new here) because it is digestible. I can feel like I can get to know Glen and some other commenters simply because I can keep up! I respect Darren Rowse and appreciate him but I feel like he is too much overwhelm. If I come back two weeks later, I’m more or less lost. Glen could write a three page post and I’d read it and welcome it because I know it is of value. Because they are several a month, I know he isn’t just trying to keep to a schedule no matter what. Thus I also would read a short post from him (probably not likely) with an open mind. Summary: Am I alone in liking fewer posts (that have real value) then daily (or G-d forbid more frequent) posts? Wow, some of them are way to long what about tl:dr. Give me 500 words or less, otherwise it’s an article not a blog. i just discovered this at the beginning of this week, i think i arrived at on of these rare and valuable blogs. thank you for sharing the analysis with us, from my point of view i think we can deal with it as indicator not as a rule . Great post man, thank you for doing the research. I will love to read more posts like that. Interesting stats. I agree with Richard Goutal on blog frequency, I have found that since I changed my blogging to less than 4 posts per week I have gotten more traffic and more subscriber’s as well. I think longer posts show that genuine effort went into the writing of the post. Do they keep reader’s more interested? Or do they just compliment what you are writing about? In any event these are important statistics for blogger’s to consider. Hm, is Glen running out of ideas? I loved this Blog so far but this was by far your worst post on this Blog. Yep – 5 years of doing this and I have no ideas after 4 months. Interesting analysis. I like your approach to finding out the average length of post. I’m an analytical mind and like to approach things scientifically as well. The numbers look higher than I expected. I often write posts over 1500 words (my niche is puppy training), but it’s not all that norm for me. I usually try to vary my article length, but my general rule is to try and keep it over 300 words and under 1500. If I start nearing 1500 words I’ll split the article into 2 or 3 parts. Righto, keep them about 400-1200 words long. Mix it up for special occasions and stretch it out if you have something extraordinary to say. Just because some people chunder on and on doesn’t mean we all have to:) Gracias amigo! As always .. very interesting post. When I was reading through the different blogs, I was wondering if there is no relation between the length of the posts and the number of posts delivered per month. You for example write longer posts but you ‘only’ write 6 or so per month. While the gadget blogs write short posts but a few a day. Perhaps it is an idea for a next post, that you count the number of words published per month per blog. I would not be too surprised if you would find out that that number is roughly the same for a lot of blogs. Readers have limited time on their hands, so they would not be willing to read 1.000 word posts on the gadget blogs I assume. 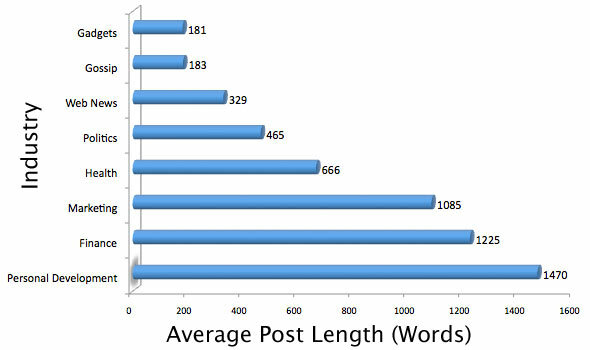 I did mention that the blogs that write shorter posts tend to publish a lot more posts. I can see that being a hell of a lot of work, but I would like to test it. I agree that it will be a lot of work, that is why I asked you to do it hahahahah. What I meant is that I think that the gadget blogs would loose a lot of readers when their blogposts would be as long as yours. So we are on the same page here. Enjoy your weekend, must be great to be back in Cape Town, at least I assume you are back there. I much enjoy your “long” articles. The in-depth analysis is what your base needs and you give it. Rock on. I like your analysis of the different blog post lengths. We are just starting out with our blog and are often asked the question of how long a post should be. I am going to take this and share it with my team. This guy, http://greatday.com/, who writes personal-development has extremely short posts, every day and he’s extremely successful, so it can be done. At the end of the day, I think one should focus on residue. How does the reader feel once he’s read your post? That’s what it’s all about — and length doesn’t really factor into that equation. Length is certainly something to think about, though. But, of course, length should be a servant to what you want to get across. In other words, the length should be entirely dependent on how long it takes you to tell your audience what you want to tell them. So it’s not really the length that matters, it’s what you tell your audience that does. Yep, I mentioned wakeuptiger as well in a comment above. It isn’t hugely popular, but it’s one of my favourite blogs. I’ve learned quite a bit while writing on my DJ blog. What I’ve found is there seems to be a certain sweet spot depending on the subject. I cover a variety of topics such as tutorials, gear and music reviews, parties and more. For the tutorials, I’ve noticed the longer the better. With these posts I try to get extremely in depth so they can become that “ultimate” reference for people. One of my largest posts reach nearly 7,000 words before I decided to trim it. For the smaller posts, such as music reviews, it seems to work much better keeping it around 500 words because people just want a quick opinion. I think the reason for this is that people can get the album and listen themselves, reading some 2,000 word post about an album will take some time so why wouldn’t they just listen to it? I think the perfect blog post length is however long you need to thoroughly explain your subject but without boring them, cutting out the fat and not wasting the readers time. Glad to see your research. It’s cool to see some of the top sites in other categories, as I don’t tend to check other niches of sites too often. It is always better to have an expanded mind than a contracted one. Post length does mean something, because it is certainly more difficult to write a more detailed post than a quick one, and although this is not to take away from short posts, it is easier for a person who regularly writes 2000-word articles to switch to 400-word ones than it is for someone who regularly writes 400-word articles to 2000-word ones. To those who see this comment, Glen has a work ethic worth modeling after. Dude you put a ton of work into this study, I really appreciate it! This is some interesting stuff, and I find that figuring out just how long to make my blog posts is something that holds me back a lot. Glen, I actually prefer short and sweet, non-the-less you have a great topic here and including visuals (graphs, images, videos) makes for blog reader eye candy. Great post, I will be watching this space from now. Congrats on your number one spot on Upgrade Reality! The research is great, but i was surprised by the statement that bigger screen makes you more productive. You’ve also mentioned that you use MAC as an OS. Does those things really help/matter and in what degree? What hardware do you actually need in order to be productive? It will be interesting for me to know in details. Also does your 27in MAC serves you better/do you use it more/ than your notebook in your EVERYDAY life. Thank you in advance. Very interesting data … what I am wondering is how this relates to attention span. I see more and more short posts … and … what about video blogs? Almost now test, yet powerful and popular. Thanks Glen! This is really a valuable post for bloggers. You researched a lot on this topic, great work! He didn’t have a blog (to my knowledge) but Nathan Myhrvold (Chief Technology Officer at Microsoft a while back) wrote 100 PAGE emails that were said to be brilliantly accessible, even to non-technology types. Warren Buffett’s letters to his shareholders are also famously comprehensible, despite averaging 20 PAGES or more, and Michael Burry (the medical doctor turned hedge fund operator who made hundreds of millions by shorting sub prime mortgage bonds) received the bulk of his original funding because of a remarkably insightful stock market blog (that he began writing while in medical school!!) which featured longer than average posts. Hi Glen. This article really enlightened me with the data you found. While I strive to write a 1000 word article, most of the time I reach half of that and that’s to say is only a start. For some reason that seems to be the average for my posts. While I strive to create more I don’t want to push myself to sound brooding. It’s all about experimenting with what works well for you and you yourself here got something which you’ve nailed. I’m sure it didn’t come overnight but the standard you’ve made, well your readers are just going to have to learn that’s just who you are. I think that’s representative of yourself through the writing. Whether readers like it or not, at least you’ve made your point. Thanks for this information. It’s actually kind of interesting noticing that things like gadgets and entertainment news are more to the point and self improvement and finance seem to be more in depth in their posts. I’d also like to test the hypothesis that the most successful blogs have a shorter word count than the average blog post. I’m not sure how one would go about getting this information given the 143 million blogs worldwide. This post was EXACTLY what i was looking for… Thank you, big time!! It’s so… fake and artificial. Am I supposed to fill my posts with fluff just to get longer texts? What if I only want to say something in 100 words. Well, I can’t since it’s too short… according to some at least. You always have something insightful to share Glen. Thanks a lot for this. I think I learnt something here again. Great research and presentation of your findings. I often wonder what is the best length as well, but personally I believe the best tip in terms of post length is to – Vary the length ! The blog will be a lot more interesting if there was a good mix of both. Too many little posts and there’s not enough information. Too many long posts and it ends up being monotonous. Just starting to look at blogging, and a co-worker recommended your article — now I’m curious about past viperchill posts as well, so I’ll be back! What would be a good length for a sports blog post? Very informative article. I like what you stressed that there are no absolute rules when it comes to blogging except to do what works. Love this article, because blog post length has GOT to be something that everyone agonizes over! I like seeing the industry and niche averages to give me some feel. I also love that fact that you share that there really are not rules in blogging! Your article gives us all a great place to start, but in the end we have to see what post lengths are working for our audience. I usually embed WordPress and Thesis Theme Video Tutorials into my blog posts, so the text does not tend to be very long. And that seem to be just fine with my audience. How about Fashion blogs? Not just about clothing and styles but about the actual industry. Do you have any stats I could use? I would so appreciate it, trying to figure out my audience before I start my blog. That was really surprising. I’m writing a series of blog posts right now to go out over the next week and each of the articles was over 1000 words. I assumed that these were all too large and I would need to break them down further into smaller chunks. 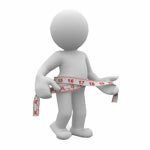 I’m glad I google the average length of a blog post and found this article! I’m going to bookmark you too so you have gained a new reader! I have often wondered about this as well – but then with bloggers like Seth Godin you see much simpler and shorter posts – which begs the question perhaps its the authority and the quality of the post rather than quantity? Thanks for writing this post. I’m a big fan of this site and your writing style. You write detailed posts and we don’t need to check other websites for the same topic. Once we read your 1 post, it’s equivalent to 10 other posts. it didn’t even cross my mind that posts for different niches would tend toward specific lengths. I love things that make important insights obvious to me. Thanks for gathering these statistics. First result on Google and exactly what I was looking for! I think there’s a place for both long form and short form. Final length should always depend on the amount of content that is delivered. A 400 word post shouldn’t be stretched to 1000 words but also I would prefer if an author shared his advice in a 2500 word post instead of leaving things out left and right to cut it to a 1000 words. Hi, Thanks for the detailed guidance. It’s a big help to someone trying to learn. I’d be curious to know the weighted average length of blog posts where the weights are driven by the readership of each blogger. I’m personally trying to answer the question of what successful (if success = size of following) bloggers produce in the way of words / blog and frequency of posts. Thank you for your insight! It is very interesting to know which industry’s readers prefer which lengths. I needed a quick answer, and you provided it! Have a great day.